Rayyane Tabet, Fossils (The Suitcase) 2014. From the Series: Five Distant Memories: The Suitcase, The Room, The Toys, The Boat and Maradona, 2006 ongoing. 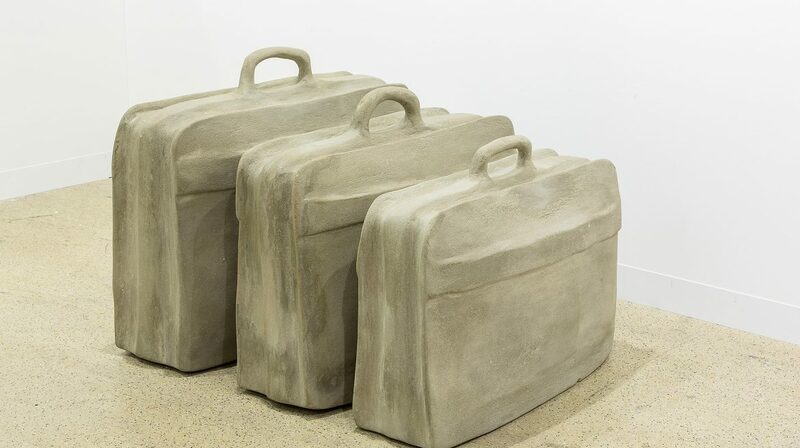 Three suitcases encased in concrete 84 × 70 × 34 cm, 90 × 75 × 34 cm, 80 × 60 × 33 cm. Image courtesy of Rayyane Tabet and Sfeir-Semler Gallery, Hamburg/Beirut. How can objects reflect our identities? An exhibition tour led by Emily Butler, Mahera and Mohammad Abu Ghazaleh Curator.